The final preschool check has been signed and hand-delivered. For the better part of eight years, we have been paying that bill. We’ve been packing small lunches, stuffing in extra outfits, kissing tearful goodbye faces and watching enormous backpacks swallow our small children as they carried themselves to school. The 25th of May marks the end of this phase in our house. The third, and final, preschooler will be done, and she will FINALLY move into the big kids’ school next year. I know they’ll do that darned cute end-of-year program, and I’ll cry like I did at her older brother and sister’s presentations. I fear that this year will be worst of all. I will cry harder than is probably appropriate, because… I am sad. I am sad my kids have grown this fast. I am sad the phase of graham cracker snacks and adorable group prayer time is over. I am sad our backward-ballcap-wearing-earphone-plugged-eleven-year old son has moved so incredibly fast past his last preschool day. I am sad our Middle Sprout has already bloomed to be interested in babysitting and boys. And Little Sprout…well, I am sad she is headed their direction. I like that right now she can flit from a beautiful princess to an evil queen in the matter of seconds. I like that she hugs and kisses me for no reason except to tell me she loves me. I love that she sings made-up songs to herself as she runs through a playground. I love that she is home a good part of the week, and I can keep her protected from all the pain and heartache that waits for her further down her path. I am seasoned enough to know parts of what awaits her. 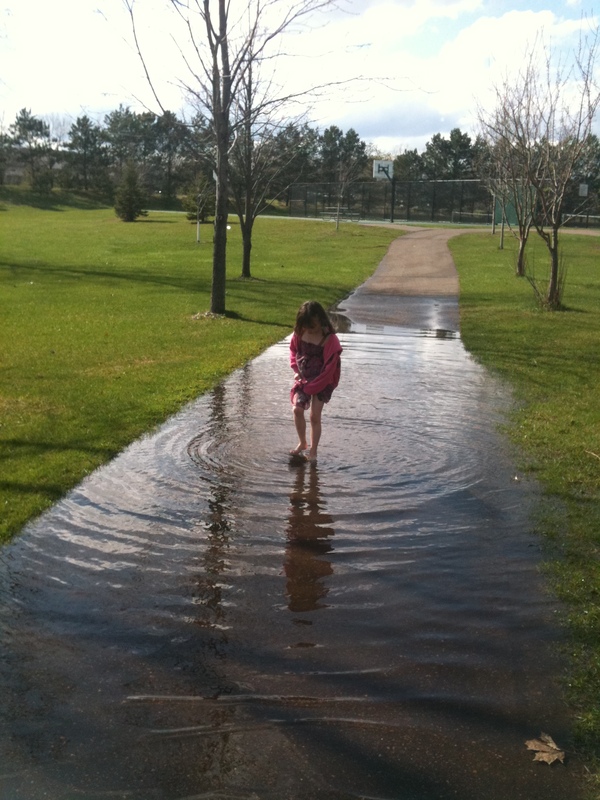 Right now she is the smiling barefoot kid who stops long enough to contemplate puddle ripples. But like that fluid water, she is moving further out from the center we’ve provided for her…and there is nothing I can do about it. So, even though I started this post with the intention of highlighting some of the funny things I’ve learned in preschool over the last eight years, I was forced to deal with this sadness. Maybe if I get out some of my tears now…I won’t be a blubbering idiot at the last day. I’ll come back to What I Learned in Preschool in my next installment. Meagan last year was my last preschool year. I was so sad!!! And, I can’t belive that my last little guy is going to be done with kindergarten in a few weeks! Nooo! Where in the heck did the time go!! It is exciting for them and for me, this year has been wonderful for me but I miss my babies!! Thanks for the great post! I get anxious just thinking about these days ahead. My little guy is barely two and I can’t imagine him in school! Permission to feel is one of the kindest gifts we can give ourselves. Cry, sweet mama. Feel it all. And know we’re here, reading you with tears of our own. Thanks for sharing. It goes so fast, doesn’t it, Meagan? My daughter has one more year of middle school and we moms are already shedding tears, just thinking about our kids’ graduation after 8th grade next year. Many of our kids have been together since kindergarten and will start the process of going off their separate ways very soon. I still miss preschool, the endless tea parties with my daughter’s stuffed animal friends, reading bedtime stories together, etc. What a lovely post. My child starts school this fall, and I am torn between joy and utter loss at the prospect. I’m getting close the end of my boys pre-school days too and it scares me! They are growing up so fast, I can hardly believe it’s real. But it’s true that each stage of growth has its own wonder and beauty. I just wish they wouldn’t pass so quickly!! Yes, all these are really true. I don’t have a kid yet but my niece is going to school already. It’s an event filled with mixed emotions. I miss her right even if she’s just in school.